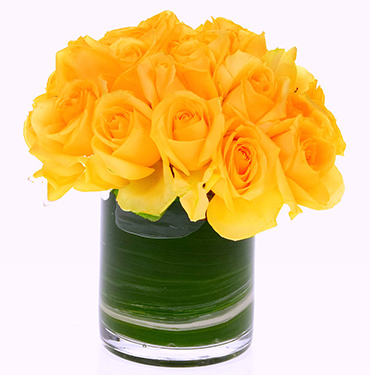 A Ti-leaf lined short clear cylinder is filled by a bunch of Twenty- Four Bold Petite Yellow roses. Approximate size: 8.5”h x 7” w.
A Gifford’s Flowers Exclusive ! Other color options available. Please specify a first and second color choice. For delivery within the Portland/Vancouver metro area . Our Designers can work with florists elsewhere to replicate this design.